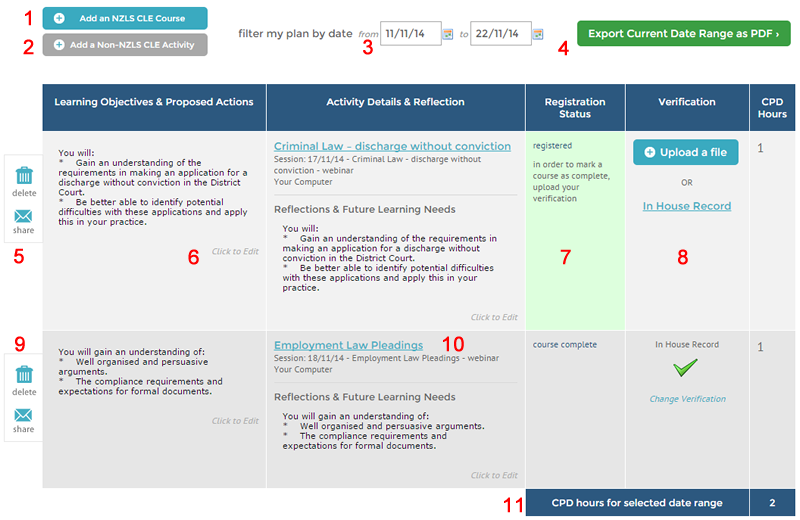 My CPD Plan and Record is here to help you plan, manage and verify your CPD - all in one place. My CPD Plan and Record already contains all of the CPD compliant courses you have completed with NZLS CLE since 1 October 2013. In the case of CLE webinars, we've even uploaded your certificates of attendance for you! We realise, a full CPD Plan and Record may include records of activities you've completed in-house, or with other providers - so we've made it easy for you to add those too. As always, we're here to help - please email cle@lawyerseducation.co.nz or phone us on 0800 333 111 if you have any questions. All that's left for you to do is log in and take a look around. 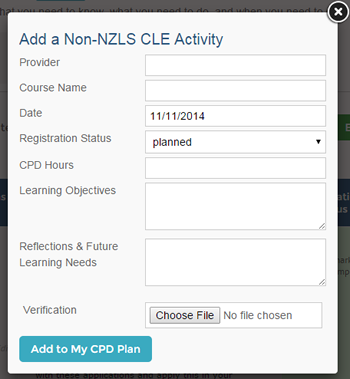 When you register for an NZLS CLE course, it's automatically added to your CPD Plan and Record. You can search for CLE courses by practice area, location, or keyword and add them to your your plan. Once you're logged in, you can also add courses to your plan from the course page on the website. Note: adding a course to your plan does not mean you have registered for it. 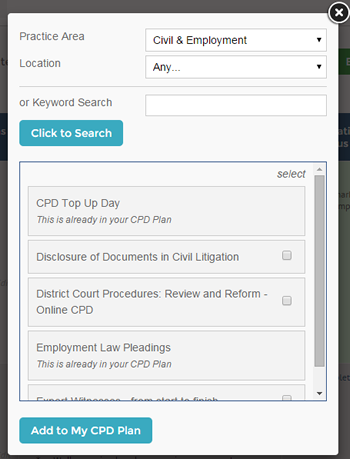 You can add CPD activities easily by pressing this button and filling in the required information. Press this button to create a pdf document of your CPD plan for the current date range that is showing. Useful if you need to send your plan to someone, or print a hard copy record. Pressing this button will create an email that contains all of the information for that particular entry on your plan. Useful if you need to seek approval to attend a course, or to encourage colleagues to come along. For CLE courses, we've pre-populated these for you. You can edit or replace them to suit your needs at any time, by clicking in the boxes. Changes are automatically saved to your plan. Courses you've added to your plan show as either planned, pending approval, registered, or complete. You can choose to upload a verification file or select In House Record if you are keeping your verification documents in hard-copy. Once you've verified your attendance, a tick will appear. Pressing this button will remove a record from your plan. 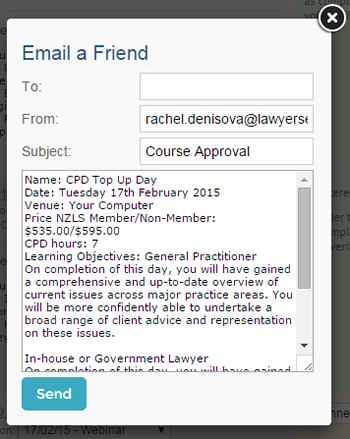 Clicking on an NZLS CLE course title will take you through to view further information about this course. The total CPD hours for the selected date range is shown at the bottom of your plan. Hours for each course are shown beside each entry - if registrations for are course are not open yet, this will say TBC.